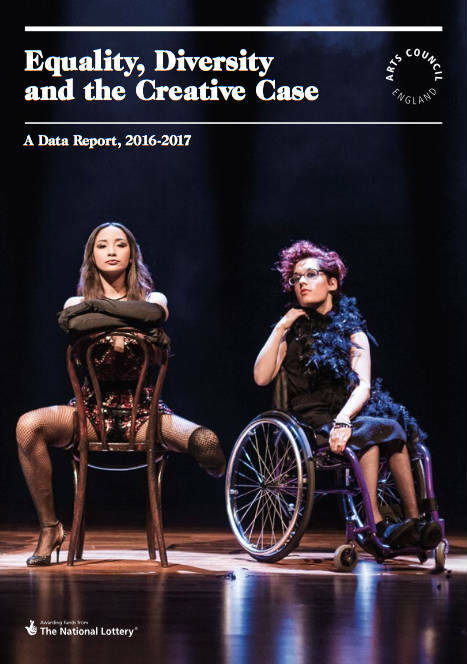 Shows that greater diversity was achieved generally in the year 2016-2017, particularly via the Grants for the Arts open-application fund. Figures show a significant rise in number and value of awards to Black and minority ethnic, disabled and female applicants. 50% of NPOs were given the highest rating for diversity, against 33% in the previous year. Notes that there is still a large gap between organisational aspiration and action. “We must recruit more diversely at all levels” says new ACE Chair Sir Nicholas Serota in the Introduction. Interestingly, “women” are now considered part of the diversity agenda, and are under-represented in senior roles in the arts.